The Mercedes-Benz E-Class Cabriolet is the replacement for the CLK Cabriolet. Although Mercedes Benz built the first of the modern hardtop convertibles this one has a fabric roof. The reason for this is far from cutting corners; it takes up much less space thus providing more interior and luggage space. The soft top also drops in just 20 seconds at speeds of up to 25mph. It’s a bigger car than the CLK and comes in a host of power choices including diesels – a first for a convertible Mercedes. The E-Class has class leading levels of ride and comfort. The steering is weighty and confidence inspiring. It is sure footed at high speeds but a little less competent on windy roads. The air flow around the car is carefully designed to keep the inhabitants calm and unflustered even at high speeds. It comes bristling with the latest technology and puts competitors to shame with its level of standard equipment. 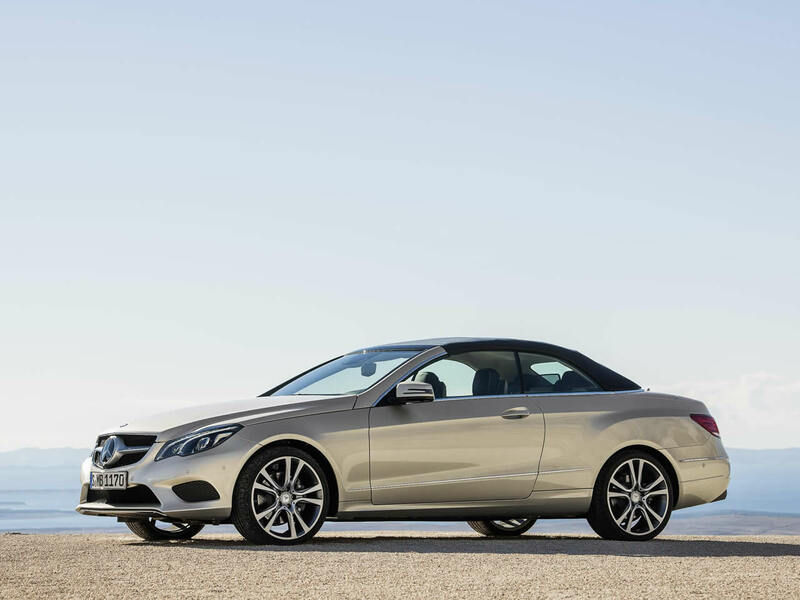 The Mercedes E-Class 200 Cabriolet may have the smallest engine capacity in the range but it is tuned to give smooth, sparkling performance. The Mercedes E-Class 250 Cabriolet is powered by the same engine as the 200 only with higher pressure turbo charger which results in boost in power without any cost to fuel economy. On the road there is a noticeable difference that many drivers will prefer. Mercedes have made huge improvements in engine efficiency allowing powerful cars such as this to become surprisingly economical. Emissions have been cut down too but with no loss in power. 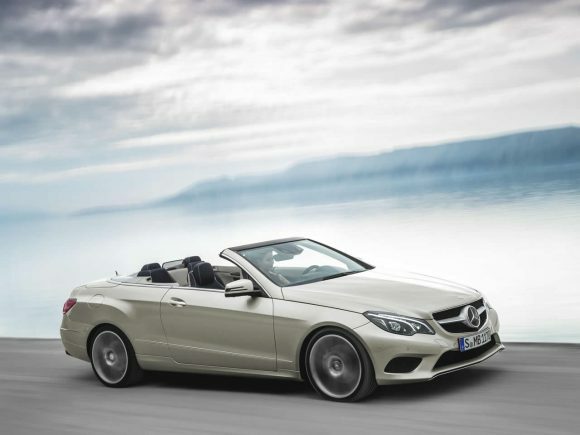 The Mercedes E-Class 350 Cabriolet is both fast and smooth while being more economical than the big V8 in the 550. It offers strong performance as well and drives with a feeling of composed quality. The Mercedes E400 Cabriolet replaces the V8 powered E500 in Europe with a more efficient twin turbo V6 engine. Although it misses out on the traditional V8 growl it is suitably smooth and has plenty of power. The fuel consumption and emissions are excellent for the levels of performance available and while it can't quite compete with the diesel options it is more refined. The E400 Cabriolet offers the type of stylish effortless transport that Mercedes do best. While it is hugely capable it is less sporting to drive than the SL. 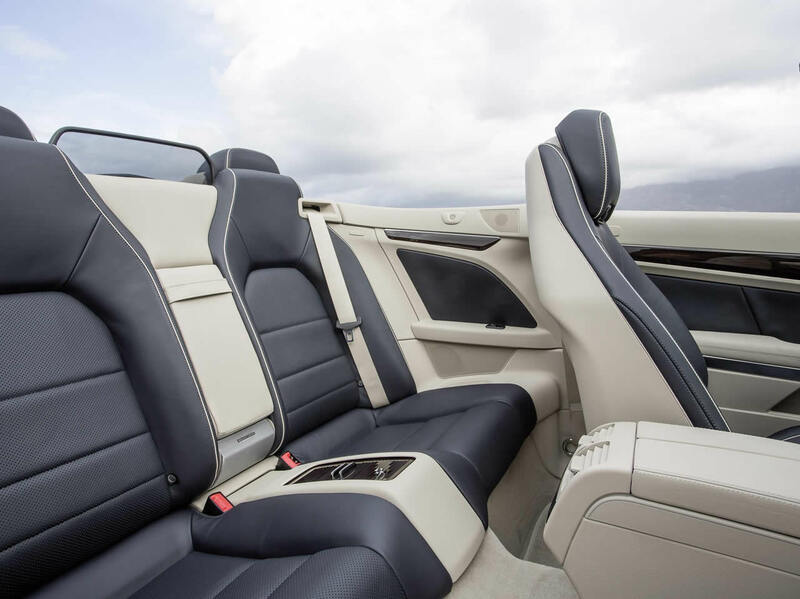 The range topping Mercedes E-Class 550 Cabriolet (sold as the E-Class 500 Cabriolet in some regions) has all the smoothly delivered power you would expect from a Mercedes V8. It sounds fantastic and works beautifully paired with the 7 speed automatic gearbox. Fuel economy and emissions are deeply impressive for such a large and powerful engine but it is clearly more thirsty than the 350's V6. The Mercedes E-Class 220 CDI Cabriolet does a great job of adding great fuel economy to the mix while suppressing the usual diesel engine noises. Performance is sprightly but not as quick as others in the range. The Mercedes E-Class 250 CGI Cabriolet squeezes extra horsepower out of the 220's diesel engine. These latest BlueEFFICIENCY engines return excellent fuel economy without sacrificing performance. The Mercedes E-Class 350 CDI Cabriolet benefits from a torquey twin turbo V6 diesel engine that gives both very smooth power delivery and excellent performance. fuel economy is impressive and it runs quietly even at high speeds. It is the smart choice in the range and feels every inch a proper Mercedes. 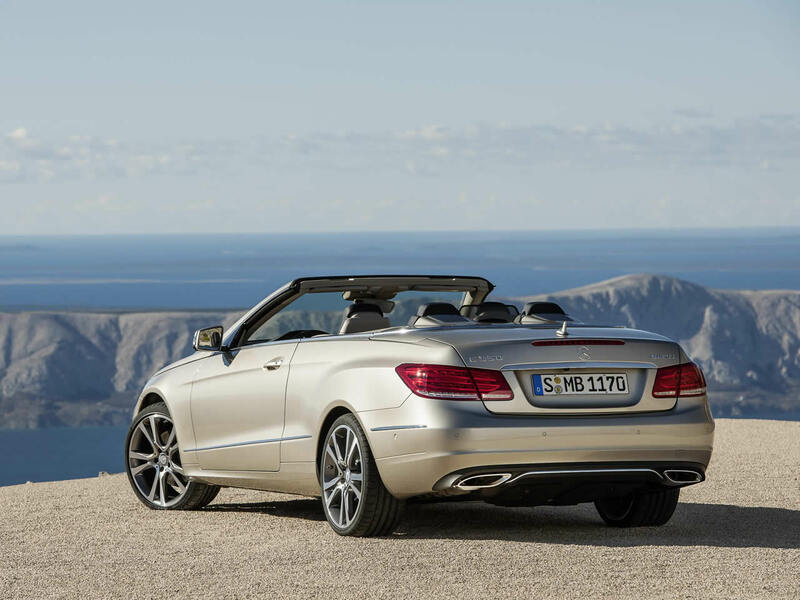 Do you drive a Mercedes-Benz E-Class Cabriolet? Would you recommend it to others? Join the conversation and let us know what you think of the car. This Mercedes-Benz currently has 4 owner reviews. I bought a e250 cdi cabriolet in June first of the 7 speed autos in white good things 64mph at 1500 revs average fuel consumption 40.9 milage from new 2150 miles on clock best 59mpg very smooth and quiet engine up to 3000revs. Bad things front end feels heavy when nipping round a roundabout or changing direction quickly engine noisy when extended. Everything else is good sports pack softer than my last 335d SE BMW but only just could be not having run flats. It’s probably one of the best motorway cars I’ve had low revs smooth engine and a hood that’s silent when up. Air cap spoiler works very well but needs the windows up and is less efficient in the back. Air scarf good but you have to buy leather to upgrade to air scarf. Car is stunning. Hope info helps. This is my fifth Mercedes and it is a great car. However, I am extremely disappointed in both Mercedes and entry design. I am six feet tall and average weight, with the driver’s seat in the normal position for my driving, it is past the door post. Thus it is impossible to get in the car without brushing against the door post. Mercedes uses a thin piece of material that wears through to the rubber in no time. Almost immediately it is worn through and showing black rubber. This is a terrible design, but could be improved by using a leather or hard cover on the strip. It costs several hundred dollars every time you have to replace it. The fact that Mercedes will not warranty this or redesign it speaks to their focus more on the mighty dollar than taking care of a great car and a previous long-time Mercedes owner. I drive the 200 blue efficiency model, and love the looks and the handling. The car is now almost two years old with 19,000 miles on the clock. It is gold (metallic beige) with a toning roof – very unusual. What would be the best way to sell it? 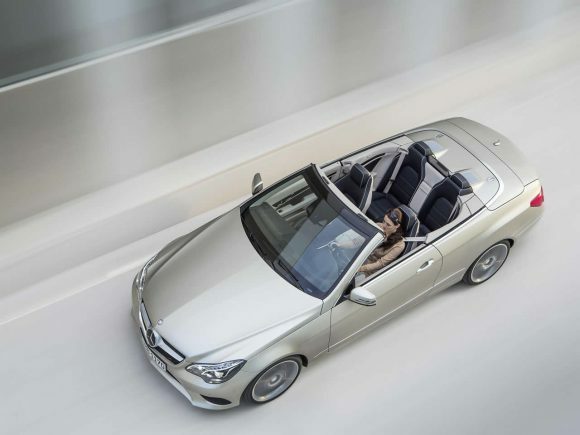 The E350 amg sport is an excellent four-seater cabriolet delivering huge torque. Attractive lines and the V6 diesel delivers about 39 mpg in town/countryside driving. AMG Lowered suspension drives well, but may not suit all. Boot with hood up is more than acceptable. Airscarf and aircap make open top driving, even during winter, a comfortable experience.